One thing Kent and I had learnt from our very first visit to the picturesque Charles Bridge in Prague was quite simply, if anyone fancied a beautiful bridge view without being interrupted by hundreds of people, the best solution was to get there very early and preferably soon after dawn! So we took our own advice and set the alarm for 5:30AM; by seven o’clock we were ready to leave our hotel for the bridge. As soon as our doorman opened the door for us, the chill and the 0°C crisp air hit us immediately. ‘Wow! Talk about freshness…’ I looked at Kent; who, just like myself was covered up from the head to toe: beret, scarf; gloves, boots… We were well prepared. Although the temperature remained low, it was a clear sky, glorious sunny day. 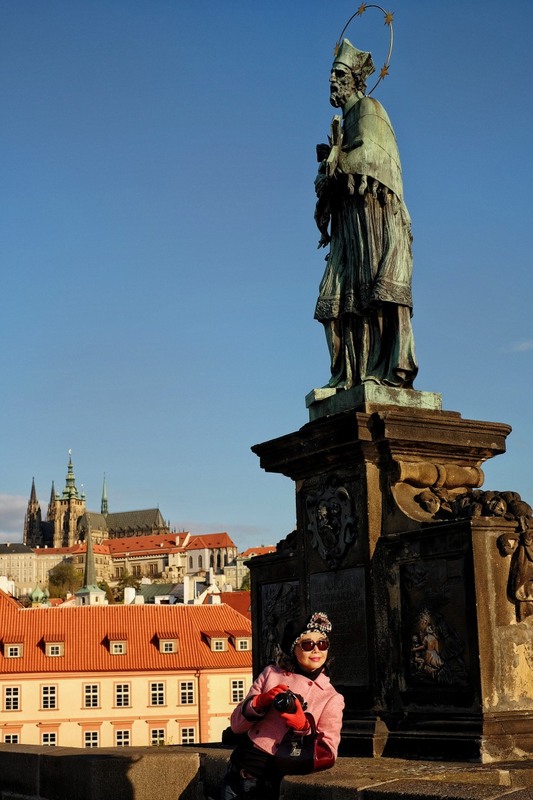 When we walked up the old stone stairs to the west side of the bridge, there it was displayed in front of us ‘boom!’: A 621-metre stretch of cobbled road and stone bridgework, about 30 saintly statues that lined both sides; ancient domes and Gothic towers of old Prague as the backdrop… Yes, that’s Charles Bridge for you! It’s hard not to fall under its magic spell! And thanks to the majority of people who chose to sleep in, Kent and I could enjoy this scenery uninterrupted and indulge in it’s medieval aura. While we thought we were early enough, actually there were other photography enthusiasts on the bridge; each taking a position with their tripod for that elusive perfect shot. Then of course, brides and grooms, the wedding photo crews were all over the bridge as well. This coterie of die hard early birds were all aiming for the same goal – nailing a breathtaking view with their camera! A big contrast to my all-cover-up ensemble were those brides (mostly Chinese and Korean), they were wearing barely-there gowns of lace or silk. Although in between shots, assistants would rush over and covered them up with big quilted coats and padded parkas, I admired their determination. ‘I thought I was baring the cold!’ I jokingly said to Kent while another oriental bride walked pass in her ‘tea bag’. Soon after as it passed eight o’clock, Charles Bridge started to get busy and it was time for us to go. ‘We’d better come here even earlier next time!’ Kent suggested. ‘Yes we should.’ I agreed as we strolled back to our hotel along the Vltava river; it was a perfect timing for some much needed hot coffee and breakfast! The way you review it, it seems like this bridge is there to connect each other’s soul, a very mystic feeling. I love the way this post is written! Like a short novel, it’s so easy to get lost in the words and imagine I’m there with you guys. Truly wonderful!! Congratulations to you both on creating such a wonderful blog!! You are so pretty in this look. Kent has so much talent! I’m glad you like it; thank you for your compliments Claire!